I couldn't even start to imagine what it would be like to experience such tragedy as this. When our very good friends over at Jodi Miller Photography got engaged and then married, their photographer of choice was the VERY talented Stephanie and Isaac of This Modern Romance. Seriously, their photographs are some of the most beautiful I have seen, yet. Maybe you've seen This Modern Romance and not even known it, they in fact are the talent behind the awesome lookbooks for Ruche. Well just last month an unexpected misfortune struck Stephanie and Isaac and they have been slowly trekking through the healing process ever since. I think it's best to not try and paraphrase, so I'll just quote from Stephanie's blog and allow her to tell you her story. I wanted to give you an update of what has happened these past two weeks. Sorry for the lack of updates and blog posts, but I’ve been so mentally, emotionally and physically exhausted and focused on Isaac that typing or even calling someone on the phone seemed impossible. Isaac is resting now after a physical therapy session, so I have some time to tell everyone what has happened these past two weeks. On Monday, September 12, Isaac had a CT scan done because over the Labor Day weekend he developed blurred, double vision. The CT scan immediately showed a massive 5cm (the size of a lime) tumor in the middle of his brain, which had begun to press on his optic nerve. He was immediately checked into the emergency room at Newport Hoag Hospital and scheduled for a craniotomy on September 15. We were too in shock to process anything really or fully grasp how in danger Isaac was. The surgeons told us there was only a 5% chance of complications, so we were positive. The brain surgery went well on Thursday, and the neuro surgeon removed most of the bulk of the massive tumor – about 20% had to be left because it was up against important structures.The tumor was benign, and diagnosed as a (prolactinoma) pituitary macroadenoma. The next day Isaac was doing really well, and then on Saturday he had a grand mal seizure for the first time in his life. I was right next to him when it happened… and it was the scariest thing I had ever witnessed. I thought I was losing him…. The following few days were a struggle, but he was making a bit of progress – walking, talking just fine, just groggy from all the trauma and meds. We were ready to be discharged on Monday, September 19th… ready to go home and heal, when suddenly Isaac lost all movement on his left side and experienced stroke-like symptoms. Instead of going home, he was sent to a series of tests, CT and MRI, and it was found that a bit of the tumor the surgeon left behind had been pressing on the middle artery in his brain due to increased intercranial swelling. His motor cortex was slowly being starved of oxygen. It was my worst nightmare… a waking nightmare. Isaac had had a stroke, and was now fully paralyzed on his left side. His usually expressive, smiling face was a blank slate and his physically strong, young body had immediately caved in on itself. He was rushed to the neuro ICU, and we spent two agonizing days there trying to reduce the swelling in his brain and shrink the last bits of tumor with medication. Once Isaac was more stable, we were transferred to the stroke unit and were monitored there for a week. Over the weekend I toured several acute stroke rehab facilities, and then Isaac was transferred by ambulance to the UCI medical acute stroke rehabilitation center, where he started intensive rehabilitation today. Right after his stroke, Isaac was unable to move anything on the left side and his speech was slurred. Now, a few days later, he can lightly squeeze my hand with his left hand, pull with his bicep a bit, and raise his left leg ever so slightly. We have a long, long road to recovery, but I know Isaac has the drive and motivation to heal and fully recover. Those that have been following the news on Facebook and twitter... thank you all for your prayers and love… a few days ago, Isaac out of the blue told me that he feels so incredibly loved. A few people have been emailing me asking if there is a way to help or donate to Isaac’s long rehab process, so I’ve set up a paypal fund. If you can donate, then I thank you. 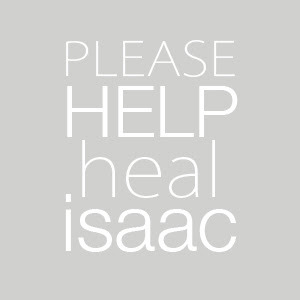 If you can’t and still want to help in any way, please pray for Isaac. If you have a personal story or know of any latest research articles on brain trauma and stroke recovery, please send them my way – I’ll be very grateful. I’ve been trying to voraciously research what he is going through in between caring for him. My goal is to get him the best care from here on out and stay in a rehab program even if I have to pay out of pocket. Isaac is by far the most amazing person I have ever met – he is my soul mate, the love of my life and my best friend… I don’t know anyone else that would stay so positive through everything he’s gone through the last two weeks… who else would thank a nurse for taking his blood or poking him with an IV… who else would apologize for being so heavy to lift or make sure to learn every nurse and aid’s name by heart. He has been more worried about me and my lack of sleep than with his current disability. His spirit is beyond beautiful. It’s these moments in life when your priorities are massively rearranged and you realize how short and precarious your life is... I don’t know what the future holds for us, but I’m trying to stay positive. Needless to say, we have been unable to work, edit, or get back to anyone via phone or email these past two weeks. All my attention has been on Isaac’s recovery. Please know that now that Isaac is in an acute rehab program, I will be able to return to work… your emails answered, album and print orders taken care of, and weddings and shoots edited. Thank you for your patience. I’ll update everyone soon. On another note, if you’d like to share Isaac’s story on your blog, please feel free to use the “Help Heal” badge. Also, if you or your loved one have any persisting symptoms or odd headaches, please don’t hesitate to see a doctor. Isaac had seen so many doctors in the past that dismissed his symptoms as signs of depression or stress or tension headaches. No one ever expects this – just celebrated his 30th birthday this year. Isaac had also just become a yoga instructor as well, ate an organic, nearly vegan diet and exercised regularly. Life is unpredictable and short, and no amount of planning could have prepared us for this. Please make each day count, and tell the people in your life that you love them a million times a day… you just never know what could happen." If this doesn't tug at your heart strings and make you take a serious gulp, I don't know what will. Although for MANY of us, there is a large distance separating us all...that shouldn't stop anyone from reaching out however they can to support and help their brothers and sisters in need. Not all of us can financially help, although if you are one who can, please click here....so that's why I'm also asking for us to pray. Prayer is a powerful thing. More powerful than some of us may really know. Stephanie and Isaac really need as many healing and comforting prayers as we possibly can. Thank you so much friends! Thank you from the bottom of my heart for your love and support.